The 9-mile segment of track running from Newark, NJ to New York Penn Station contains the highest density of train/mile per track/mile in the entire Amtrak system and one of the highest ratios of train movements per track in the United States. From Newark Airport Station, six tracks converge to four tracks at Hunter Interlocking before diverging to six station tracks at Newark Penn Station (exclusive of the PATH train). From Newark, the six station tracks converge to three tracks at Dock Interlocking and then converge once again to two tracks at Hudson Interlocking. These two tracks proceed over the Portal Bridge, through Secaucus Junction, and through the century-old North River Tunnels where they arrive at New York Penn Station. If it were just Amtrak that were looking to upgrade this section of track, they would have a hard enough time alone due to the existing infrastructural limitations. However, for the more than 100 daily Amtrak trains traveling between Newark to New York, there are over 400 NJ Transit trains across six commuter lines that also share this vital segment of rail. 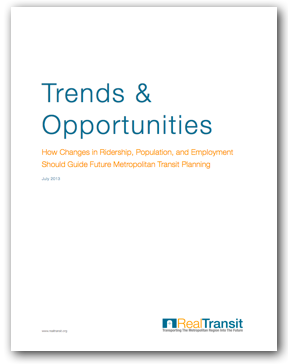 Thus, this strategic bottleneck not only poses challenges for intercity rail passengers, but, to a much larger extent, represents a longstanding obstacle to the expansion of local and regional transit for metropolitan commuters and residents. 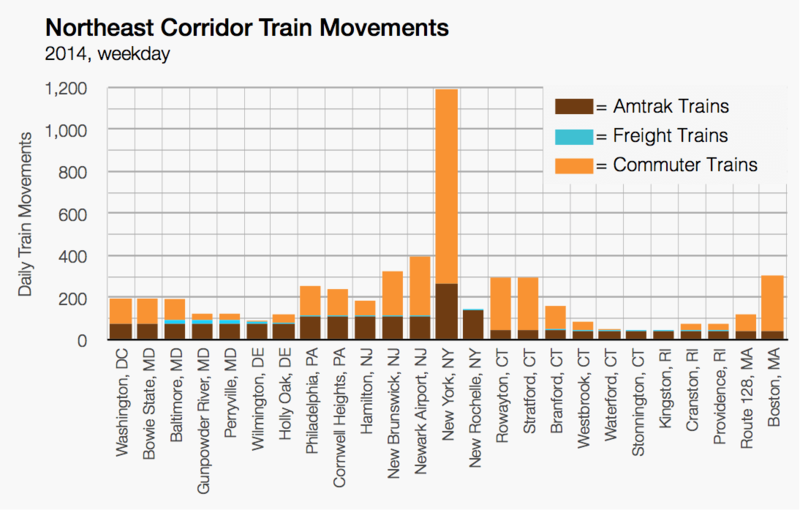 Indeed, Amtrak consists of just 5% of total Penn Station ridership during rush hours. 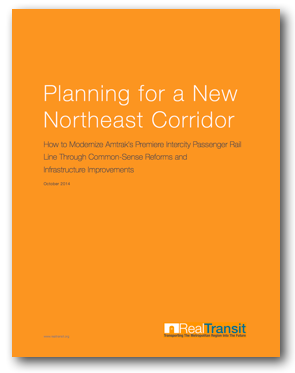 Moving forward, it is crucial that improvements to this segment of the Northeast Corridor comprehensively address the unique obstacles faced by not only Amtrak, but also the New York metropolitan region as a whole. 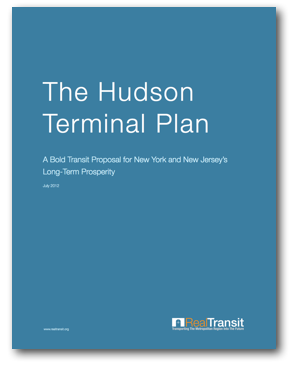 Real Transit’s Hudson Terminal Plan seeks to address the broad-based transportation challenges currently facing the New York metropolitan region, including the lack of adequate cross-Hudson rail capacity, a limited number of tracks and platforms serving Penn Station, and a gap in mass transit service to Manhattan’s West Side. Other recent proposals, including Amtrak’s Gateway Program, have suggested the construction of just two new tracks along the existing Northeast Corridor alignment from Newark into an expanded Penn Station. However, because of existing infrastructural limitations, these proposals come with great costs for minimal relative benefits. Simply put, any high-speed rail plan that involves Penn Station will sacrifice costs in order to continue relying on an overcrowded, century-old alignment. 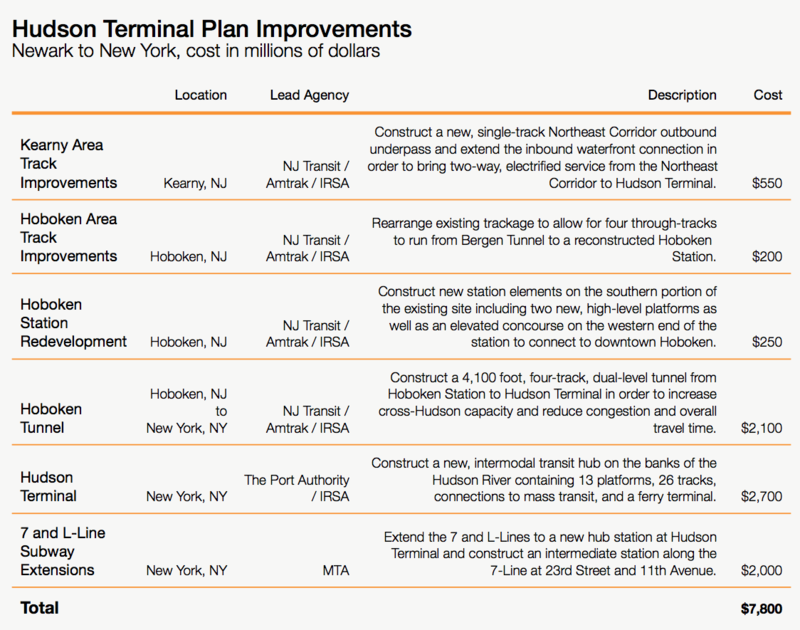 The Hudson Terminal Plan suggests utilizing an alternative alignment—NJ Transit’s Morris and Essex Lines—that, while already in use, is far less crowded, contains four tracks, and already terminates at the banks of the Hudson River in Hoboken, which would in turn contain costs significantly. Since NJ Transit completed the Kearney Connection in 2003, which created a crossover from these lines’ northernmost track to the Northeast Corridor at Swift Interlocking, 60% of NJ Transit’s Morris and Essex Lines trains have been diverted to Penn Station instead of Hoboken Terminal. This connection left the segment of track from Swift Interlocking to Hoboken Terminal underutilized, mostly because the majority of riders wish to terminate in Manhattan as opposed to Hoboken. 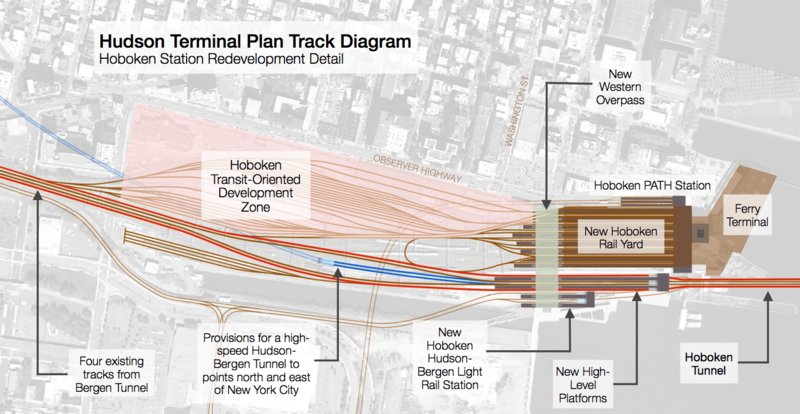 The Hudson Terminal Plan suggests redirecting high-speed trains along the Northeast Corridor to these underutilized tracks and extending them from Hoboken to a new, waterfront station in Manhattan. Not only would the Hudson Terminal Plan reduce demand for Penn Station-bound trains, thereby containing growth and decreasing congestion, but high-speed trains would also be able to bypass the densest segment of track in the nation in order to take a shorter, faster, and higher-capacity route into New York. In 1991, NJ Transit completed the Waterfront Connection, which joined a previously converging Northeast Corridor track to NJ Transit’s Morris and Essex Lines. This connection allowed, for the first time, Northeast Corridor trains to terminate at Hoboken Terminal. The single-track connection converges with the third track of the Morris and Essex Lines at Meadows Interlocking, but a fourth track diverges once again at West End Interlocking just before the Bergen Tunnel, thus leaving an effective gap in the fourth track of the alignment. 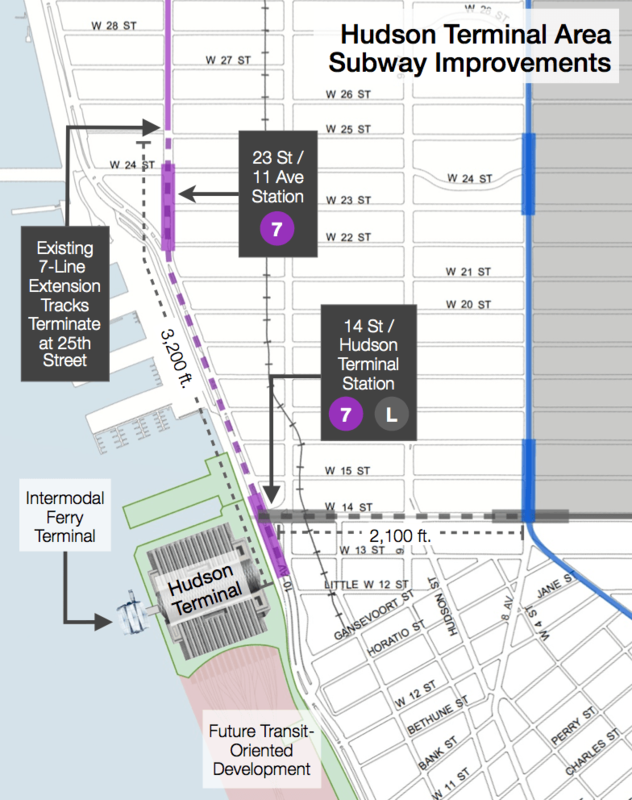 The Hudson Terminal Plan suggests filling this gap by extending the single-track Waterfront Connection from Meadows Interlocking to West End Interlocking. This extension would allow an inbound Northeast Corridor train to travel on a dedicated track from Newark to Hoboken. 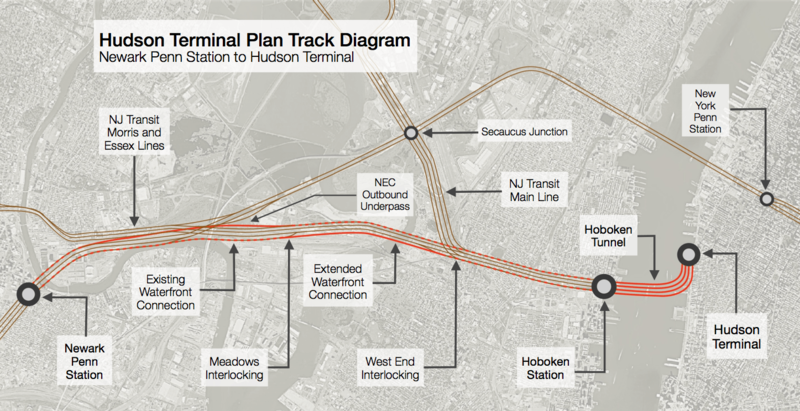 For an outbound track, the Hudson Terminal Plan suggests constructing a single-track underpass from the western end of Meadows Interlocking, under the Kearney Junction, to NJ Transit’s Hudson Yard, where it would join the Northeast Corridor at Rea Interlocking. Since the majority of inbound Morris and Essex Lines trains leave this track at Swift Interlocking heading towards New York Penn Station, this underpass would fill underused capacity and, for the first time, allow an outbound Northeast Corridor train to travel on a dedicated track from Hoboken to Newark. In order to bring trains from Hoboken to Manhattan efficiently and quickly, Hoboken Terminal must undergo a number of improvements in order to transform it into Hoboken Station. Track upgrades would bring the four main feeder tracks from Bergen Tunnel to two new, high-level platforms at the southern end of the station, which would ensure faster inbound and outbound service through Hoboken. The existing platforms and tracks would become a new Hoboken Rail Yard for storing NJ Transit and Amtrak trains. The two exterior tracks will chiefly accommodate Amtrak and NJ Transit service from the Northeast Corridor, while the two interior tracks will chiefly accommodate existing NJ Transit Hoboken Division service. The inner two tracks will also connect to a future high-speed rail line traveling from New York City to points north and east. In addition to commuter rail, the Hoboken Station Redevelopment will also include the reconstruction of the Hoboken Hudson-Bergen Light Rail (“HBLR”) Station with a connection to Hoboken Tunnel. This new HBLR connection will provide residents of Bayonne and Weehawken a one-seat ride into New York City and will supply residents of Hoboken and Jersey City yet another direct route into Manhattan. As trains depart Hoboken Station heading towards Manhattan, tracks will gradually submerge beneath a unified eastern platform before arriving at the entrance to Hoboken Tunnel. This will ensure that trains sustain minimum grade decreases while simultaneously providing a seamless, ADA-accessible concourse between the two new platforms, the new Hoboken HBLR Station, Hoboken ferry service, and the existing Hoboken Station structures. In addition to the construction of new platforms and the demolition of existing structures, Hoboken Station will also include the construction of a new Western Overpass to allow additional pedestrian accessibility to the City of Hoboken, NJ Transit Bus, and the Hoboken PATH Station. In addition to the improvement and redevelopment of the actual rail infrastructure, the construction of new tracks and tunnels will coincide with the long-delayed Hoboken Redevelopment Plan. The most recent iteration of this plan seeks to preserve and enhance the quality of life in Hoboken through smart growth and transit-oriented development. New office zoning in close proximity to the station will allow for the establishment of a modern commercial district in downtown Hoboken, while residential zoning changes along Observer Highway will support the influx of workers and commuters into the surrounding areas. From the western banks of the Hudson River, the new four-track, 4,100-foot Hoboken Tunnel will travel eastward from Hoboken towards Manhattan. As the tunnel approaches New York, the four tracks will curve northwards, traveling parallel to the western coast of Manhattan before arriving at a new, premiere transit destination on the Hudson River—Hudson Terminal. Located at the intersection of 14th Street, 11th Avenue, and the Hudson River, Hudson Terminal will accommodate 26 tracks across 13 platforms. Unlike many new urban train stations, Hudson Terminal will enjoy the unique advantage of starting with a completely blank slate within the most densely populated city in the nation. This will allow the station’s designers to take advantage of the most efficient, long-term track layout without having to worry about razing occupied buildings and rerouting dense networks of underground utilities and other structures. Hudson Terminal will feature extra-long, columless platforms with multiple ADA-compliant entrance and exit points. Further, provisions will be made at the time of construction to one day accommodate a second, sub-level of platforms beneath the main structure and/or additional trackage to points north and east. The outer terminal tracks, which would serve Northeast Corridor trains, will loop around the northern end of the terminal to allow for Amtrak and future high-speed trains to continue to additional destinations without reversing the direction of the train. Two additional loops will lead to dedicated island platforms below the main track level, which will serve Hudson-Bergen Light Rail trains as well as other future shuttle services. In order to provide mass transit access to Amtrak passengers and regional commuters arriving at Hudson Terminal, two strategic connections must be made. First, the 7-Line subway will be extended 3,200 feet to 14th street, and new stations at 23rd street and Hudson Terminal will be constructed along this route. This extension would bring Amtrak travelers and New Jersey commuters a direct connection from Hudson Terminal to the Hudson Yards, Times Square, Bryant Park, Midtown East, and Long Island City. In addition, New York will finally have a direct subway transfer between rail terminals serving the Northeast Corridor / NJ Transit (Hudson Terminal) and Metro North (Grand Central Terminal). Second, the L-Line subway will be extended westward by 2,100 feet from its current terminus at 8th Avenue to a new station at Hudson Terminal. Under the Hudson Terminal Plan, cross-Hudson rail capacity would triple, which would allow planned service expansion to continue without the capacity challenges currently threatening growth. In addition, the City of Hoboken will be able to move forward with a redevelopment plan while incorporating new connections into Manhattan for New Jersey waterfront communities along the Hudson-Bergen Light Rail system. The construction of a new, premiere rail station in Manhattan will serve as the centerpiece of Amtrak’s future high-speed rail network. And New Yorkers will see new mass transit improvements open up areas of Manhattan’s West Side that have been historically underdeveloped. Because of the comprehensiveness of the benefits of the Hudson Terminal Plan, funding for the various elements would come from several metropolitan agencies in addition to federal funding from IRSA. For instance, while the subway elements would be managed by the MTA, the actual Hudson Terminal station structure would be owned by the Port Authority of New York and New Jersey with space leased out to the various railroads. South of Hudson Terminal, future real estate developments will also help finance the construction and maintenance of Hudson Terminal’s trackage, platforms, and structure. Overall, the Hudson Terminal Plan will finally relieve the congested segment of track along the Northeast Corridor from Newark to New York that, without significant improvement, will continue to prevent the implementation of a truly modern high-speed rail network.